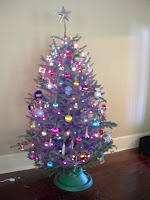 I got my tree this week and it is now up and decorated. It was a steal at only $8 (I'm a bargain hunter even when it comes to my tree!) 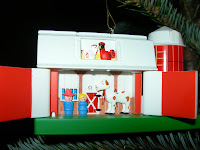 I love to take all the ornaments out of the boxes and carefully plan how they will all be arranged on the tree. I have my old favorites, but look forward to adding a few new ones each year. 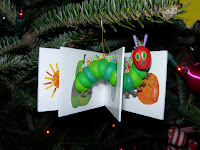 My 2 additions this year from Hallmark are a Fisher Price Little People Barn ornament that is an exact replica of the real thing-we had one growing up and I'm sure it's still around somewhere, and The Hungry Caterpillar book ornament that has always been a favorite of mine. The Cabbage Patch doll is an old one. 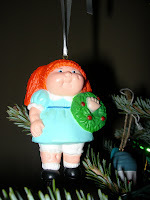 I had the actual doll that matches the ornament. 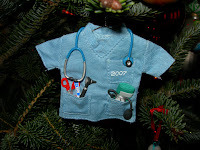 The Scrub Top was added last year. I'm starting to feel very Christmasy. Christmas music is playing almost constantly in my house now. The baking has started and will be in full swing this weekend. The traditional cut-out Christmas cookies will of course be made, but this year I'm trying my hand at my Granny's chocolate fudge and the McGowan gingerbread cookies. If you are lucky enough to live near me, you will get to sample some of these wonderful goodies!